Creating computer slide shows is very easy with MySlideShow. This simple and straightforward software application offers its users a comprehensive toolkit for making bright, memorable and esthetically pleasing slide shows and photo albums. The program is quite elementary - select pictures, indicate the desired sequence (or choose random order), apply special transition effects, and you get a professionally looking slide show with one button click. 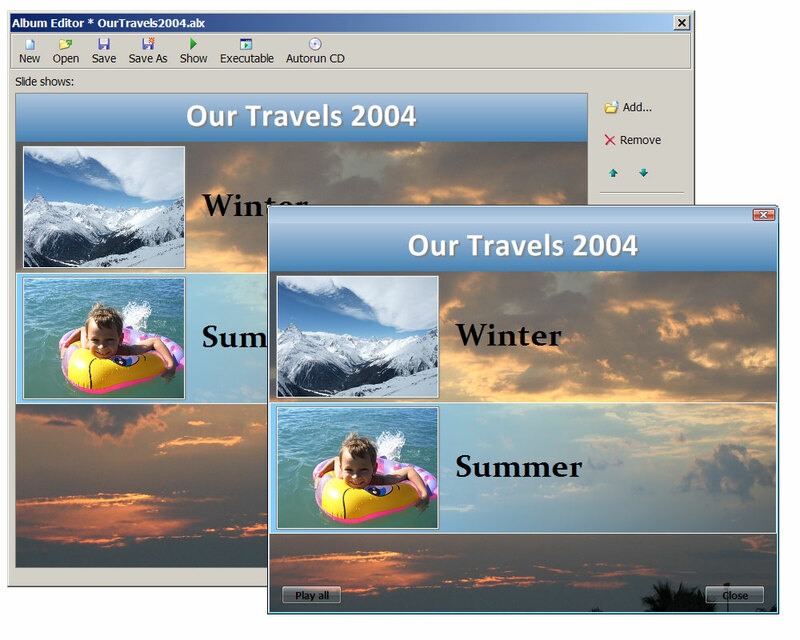 Conveniently, photo albums, thumbnail web galleries, screensavers, video CDs and DVDs can be created with the same program! MySlideShow is jam-packed with helpful features, meaning you will never have to buy any additional software. For example, MySlideShow is capable of adding and editing slide captions (it's possible to use EXIF and IPTC tags), changing picture orientation, synchronizing slide shows with music and sound effects. All options can be applied to individual images or entire sets of pictures; the slide show can go on in automatic and manual modes, making it possible to use MySlideShow for creating presentations. Your slide show can have a playlist synchronized with slides, an independent background playlist and slide-specific playlists. You can add background music and narration/voice-over audio files. The Slide Editor in the MySlideShow Gold allows you to place additional text boxes, web links, small images, Flash animations and video clips on slides. Importantly, the program is capable of packing slide shows into standalone executable and screensaver files (.exe and .scr respectively), thus making it very easy to distribute them. The Video Generator plug-in allows you to burn VCD, SVCD, DVD video discs and create VCD, SVCD, DVD, WMV and DivX video files from your slide show projects. These features are just a small fraction of what the software has to offer its buyers. And best of all, anyone can try MySlideShow free of charge. The program offers unique features for photographers who want to distribute their executable slide show files to end users. You can create trial slide shows which expire after N days, X tries or on a specific date. Then your customers can order the fully-functional slide show and/or unlock the trial slide show with a password you send. Registered users can distribute MySlideShow presentations (slide shows, albums, web galleries or video files) for free. No royalty fee is required. The Business License is required if you want to create and distribute MySlideShow presentations for commercial purposes. Allows you to customize various slide settings. Has font and color settings for the image information text. Plays background music during whole slide show from a special play list. 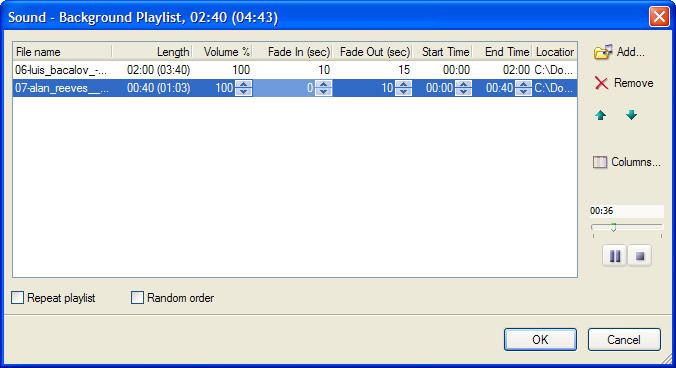 Each track in the playlist can be customized with the Start Time, End Time, Fade In and Fade Out options. Plays narration or voice-over audio files (can be used together with background music). 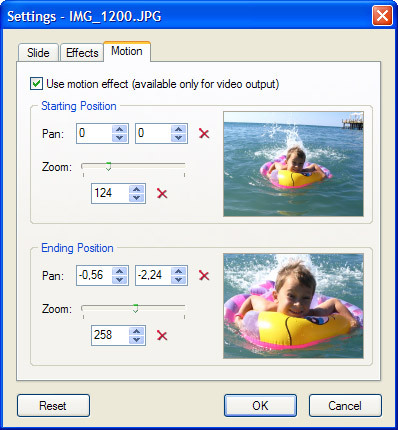 Supports Motion (Pan and Zoom) Effects for output video files (only in Gold version). Allows you to collect several executable slide shows into an Album. Creates output slide shows as standalone executable (.exe) files or screen savers. Creates output slide shows as video files and burns video CDs and DVDs. Generates HTML pages with thumbnails (web galleries) for publishing on the web. Can display a thumbnail/navigation panel during the slide show. Supports multi-monitor systems: slide show and thumbnail/navigation panel can be displayed on different monitors (for example, on the notebook screen and a projector if you make a presentation). MySlideShow is available in the Standard and Gold editions. The following table displays main features and differences between MySlideShow and MySlideShow Gold. ~ 8-16 MB free disk space. Internet Explorer 7.0 or higher for creating web galleries. Just a note to compliment you on creating the best and most complete slide show software on the market. I am a professional entertainer who includes movie trivia and more in my karaoke shows as well as trivia games on DVDs that I do at children's parties. I have tried every slide program available from those requiring special viewers to those that produce flash slide shows. However, I have never found one as complete and well written as yours. You have definitely covered all bases and I just want to say thanks for a great product. Steve @ In Touch Creations, Inc.
Main window is similar to Windows Explorer. Contains folder, file and slide lists and preview panel. Start Screen option displays slide images as Filmstrip and Previews. Project and Slide Settings windows. 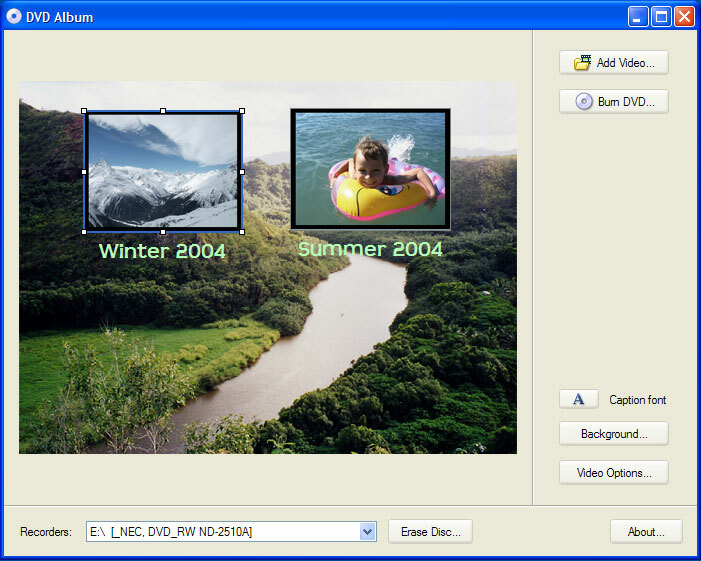 Slide Editor allows you to add small images, text boxes and web links. Slide Editor is included in MySlideShow Gold. 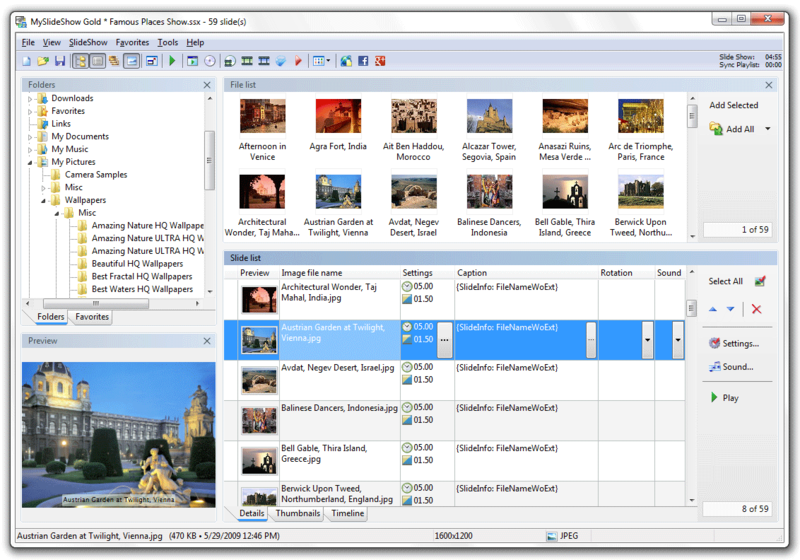 Timeline Editor is included in MySlideShow Gold. 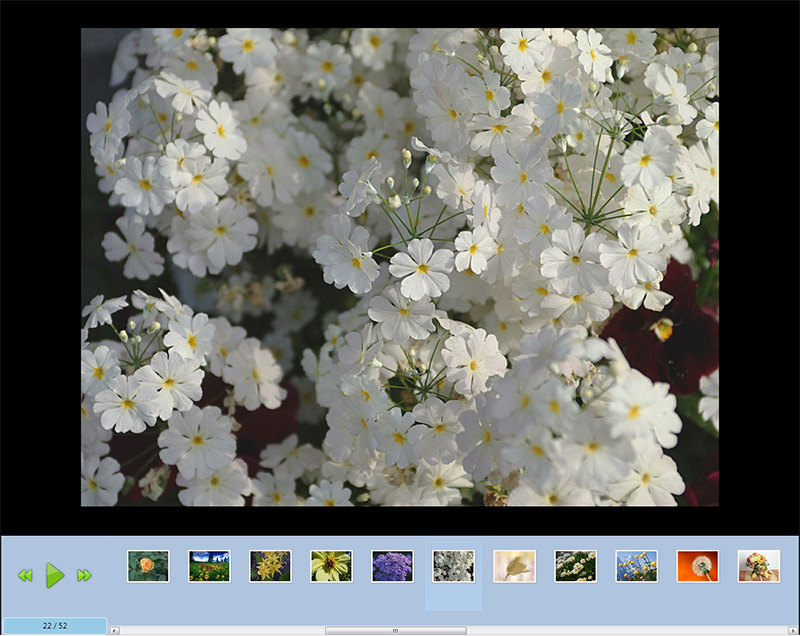 The plug-in is free for registered users of MySlideShow v3.x. The Print Thumbnails plug-in can print your slide list as a thumbnail table or a contact sheet. You can change different settings: thumbnail size, margins, number of rows and columns. 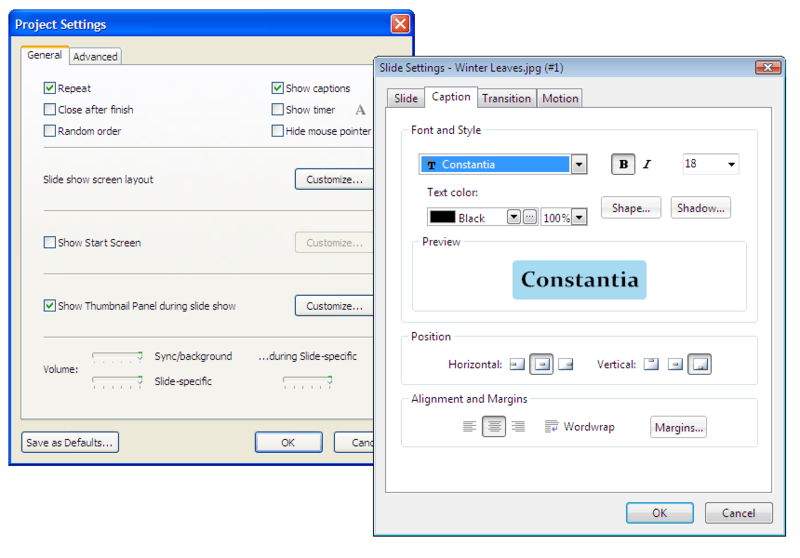 The plug-in displays your slide list in the preview mode, can print slide captions, page header and footer. 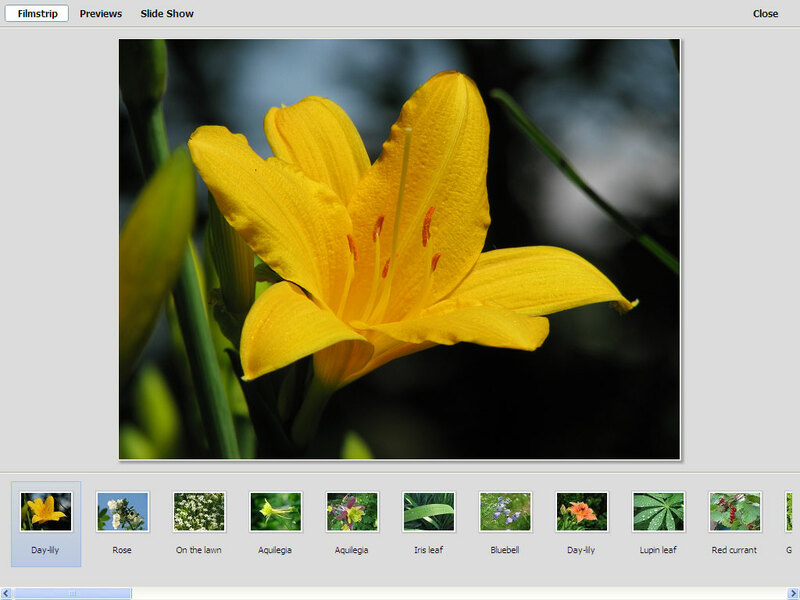 The plug-ins are free for registered users of MySlideShow v3.x. Just install the latest version over your current one. Upgrade from v2.x to v3. There is no need to uninstall MySlideShow v2.x. By default, MySlideShow v3 installs in a separate folder and adds a new icon on the desktop. If you'd like to buy an upgrade, please click here.